One thing that always amazes me when I think about the internet and communication is the way news travels – how things ‘go viral’ and become so popular that it seems everyone is suddenly aware of a new song, image or joke. The way that information travels is particularly clear when we observe the statistics information created by WordPress concerning this blog. Using the statistics, it is possible to see where our readers come from, how they found the blog and what links they clicked on. By far our most popular post has been on the implementation of a 1:1 iPad program in a primary school – on an average day, this post garners over at least ten times the number of hits the other posts receive – a huge difference. From what I can see, the vast majority of hits are coming from Pinterest. 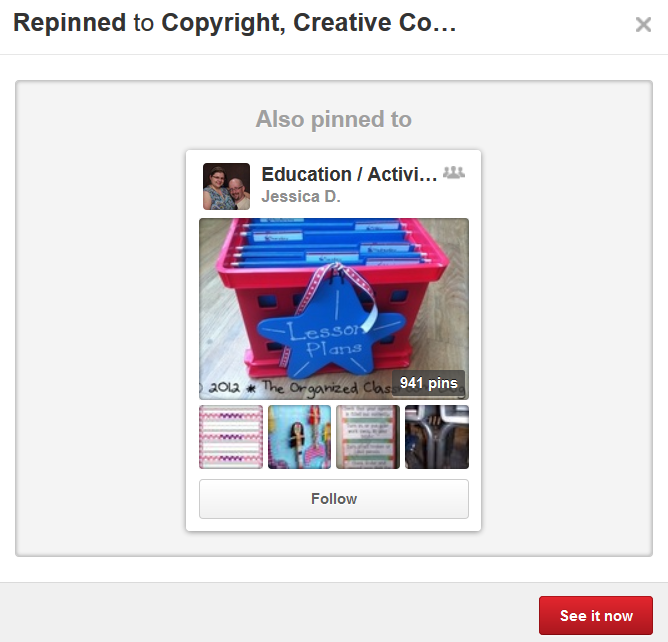 One or two readers have ‘pinned’ an image of a classroom poster in Pinterest, and hundreds of others have repinned this image, and visited the blog as a result. Quite a few readers also come from Twitter, where I share a link each time a write a new post, and the remainder come from a variety of other sources. A typical ‘tweet’ sent out to followers on Twitter, alerting them to a new blog post. It seems that Pinterest is no longer just the domain of crafters and those wishing to share recipes – but also a huge educational community, drawn by the ability to share great websites and classroom ideas easily, and what’s more, visually. After a long day of teaching, it is hard to come home to face screens full of text. However Pinterest’s visually appealing and simple interface allows you to scroll through hundreds of contributions, clicking on those that appeal and digging deeper by visiting the website where the image came from if more investigation is warranted. The improvements Pinterest recently made, linking pins to the board where it came from, as well as a board where someone else has also pinned it makes searching even more fruitful, as one pin is likely to lead to a host of others on a related theme. When you re-pin an image, this helpful board pops up, with somewhere else where you are likely to find related pins. Pinterest seems an unlikely place to go for professional development. However, if you are brain drained and in need of inspiration, boards created by Stephen Heppell, Trish Wade or Vicki Davis are just a starting point for great ideas, curated from all over the world. 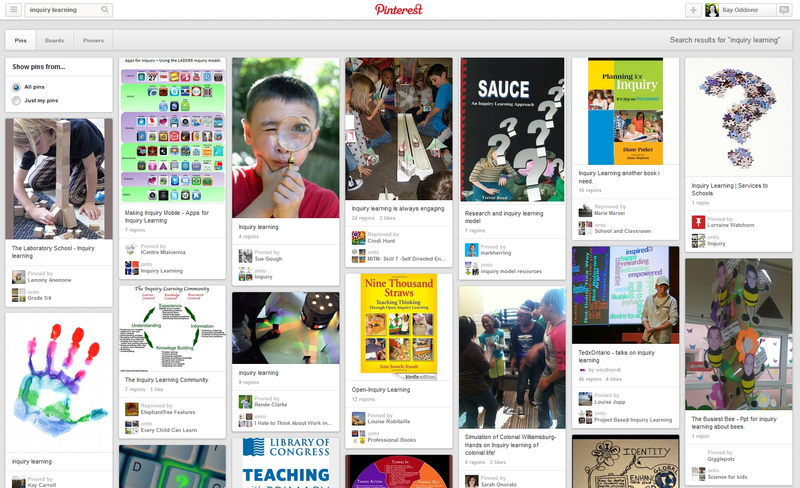 I maintain a few boards also – focusing on apps for inquiry learning, creative commons images and book trailers, to name a few. You can see an example of some of my Pinterest boards below. It seems that the path to discovering quality information and resources is no longer just a direct line to Google. We know many students do much of their research via YouTube, and so it seems, many teachers are using tools such as Pinterest to direct their searching via items that others have already collated. Why start at the beginning, when half the search has already been done for you? This entry was posted in Resources, social media, Web 2.0 tools and tagged curation, educational resources, information management, pinterest, social media by ResourceLink Brisbane Catholic Education. Bookmark the permalink.